Young generation scientists are one of the main target groups the activities of the Wilhelm und Else Heraeus Foundation are addressed to. Therefore, in 1989, the foundation together with the DPG established a program that gives young physicists in an early period of their scientific career (Master, Diplom or PhD thesis) the opportunity to present their own scientific results to a censorious audience. 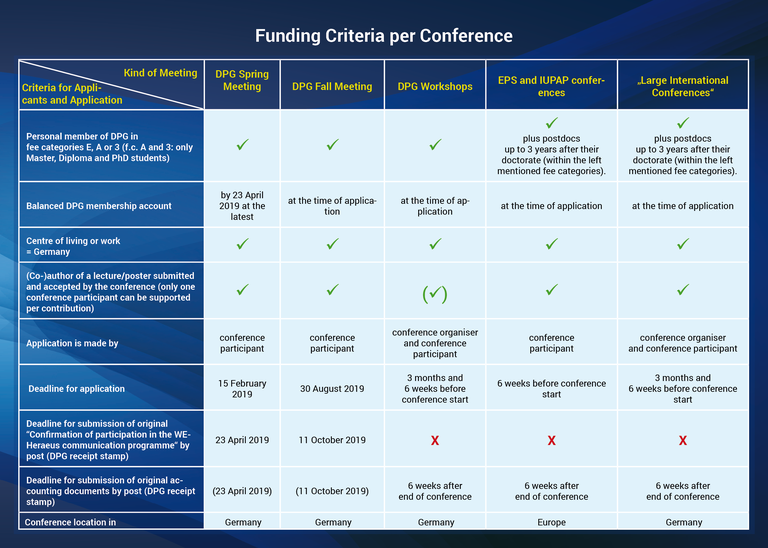 ⇒ detailed funding criteria and information for applying teh funding for "Large International Conferences"
The Deutsche Physikalische Gesellschaft wants to express its thanks and gratitude for the generous support and assistance of young scientists by the Wilhelm und Else Heraeus-Stiftung. We hope that young physicists will continue to take the chance to communicate with scientists at the conferences – as already 35.000 young scientists have done before.